A fruit and gourmet basket is a thoughtful way to share your condolences. 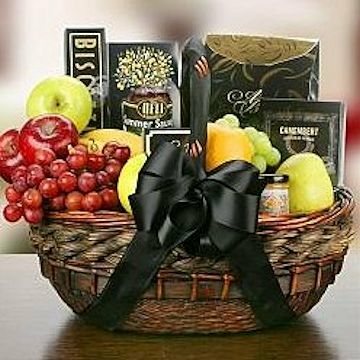 A wicker basket is filled with fresh fruits and select foods such as cheese, crackers, and cookies. Simple, dignified, respectful. This is a hand delivered fruit basket gift. These gifts are delivered by one of our local design centers located throughout the United States and Canada.